Nyota Uhura (/niˈoʊtə ʊˈhʊrə/) is a fictional character in the Star Trek franchise. The character was portrayed by Nichelle Nichols through the sixth Star Trek film. Since 2009, a younger Uhura has been portrayed by actress Zoe Saldana. Uhura is a translator and communications officer who specializes in linguistics, cryptography, and philology. She was an important part of the original series' multicultural crew and one of the first black actors to be featured in a non-menial role on an American television series. Gene Roddenberry had intended his new female communications officer to be called "Lieutenant Sulu". Herb Solow pointed out how similar this was to "Zulu" and thought it might act against the plan for racial diversity in the show, so the name Sulu remained with George Takei's character. "Uhura" comes from the Swahili word uhuru, meaning "freedom". Nichols states in her book Beyond Uhura that the name was inspired by Robert Ruark's book Uhuru, which she had with her on the day she read for the part. When producer Robert Justman explained to Roddenberry what the word uhuru meant, he changed it to Uhura and adopted that as the character's name. Coincidentally, the end credits of the film Star Trek VI: The Undiscovered Country incorrectly refer to Uhura as "Uhuru". Uhura's first name was not used in Star Trek canon until Abrams's 2009 film. The mystery regarding Uhura's first name is the subject of a running joke in the film, as Captain Kirk repeatedly tries to find out what it is, before finally hearing Spock call her "Nyota" in a moment of intimacy. Although other non-canon names had previously existed, "Nyota" had been the most common. Author William Rotsler created the name "Nyota" for his 1982 licensed tie-in book, Star Trek II Biographies published by Wanderer (Pocket) Books. Seeking approval for the name he contacted Gene Roddenberry and Nichelle Nichols. Gene Roddenberry approved of the name. Nichelle Nichols also approved and was very excited when Rotsler informed her that Nyota means "star" in Swahili. After originating in Star Trek II Biographies "Nyota" started appearing in Star Trek novels, such as Uhura's Song by Janet Kagan. While guest-starring on the game show Super Password on January 7, 1987, Nichols stated that Uhura's first name was "Nyota". That "Nyota" is the Swahili word for "star" is mentioned by William Shatner in his book Star Trek Memories. Startrek.com uses the name Nyota on its character biography page for the Animated Series but not on the TOS biography page. "Nyota" was also used as Uhura's first name when Nichols reprised the character in the fan film Star Trek: Of Gods and Men. According to FASA's Star Trek: The Role Playing Game, Uhura's first name is "Samara". The non-canon book The Best of Trek suggests that Uhura's first name is "Penda", coined when a group of fanzine authors suggested it to Nichols at an early convention. Soon after the first scripts for Star Trek were being written, Gene Roddenberry spoke of a new character, a female communications officer and introduced Herb Solow and Robert Justman to Nichols, who had worked for him on The Lieutenant. Although "The Cage" (the first pilot episode of Star Trek, featuring a female first officer, Number One) was knocked back, Roddenberry continued to seek diversity in his casting for the series, including a greater emphasis on racial diversity, with Nichols as Uhura and George Takei as Sulu. Uhura's role of "answering the phone" has been described as gender normative for the era. Nichols planned to leave Star Trek in 1967 after its first season, wanting to return to musical theater. She changed her mind after talking to Martin Luther King, Jr. who was a fan of the show. King explained that her character signified a future of greater racial harmony and cooperation. King told Nichols, "You are our image of where we're going, you're 300 years from now, and that means that's where we are and it takes place now. Keep doing what you're doing, you are our inspiration." As Nichols recounted, "Star Trek was one of the only shows that [King] and his wife Coretta would allow their little children to watch. And I thanked him and I told him I was leaving the show. All the smile came off his face. And he said, 'Don't you understand for the first time we're seen as we should be seen. You don't have a black role. You have an equal role.'" Uhura, from the United States of Africa, speaks Swahili and was born January 19, 2233. James Blish's non-canon novels identify her as Bantu, as does Gene Roddenberry's novelization of Star Trek: The Motion Picture. Uhura first appears in the episode "The Man Trap", joining the crew of the USS Enterprise as a lieutenant, and serves as chief communications officer under Captain Kirk. She is depicted as a capable bridge officer and readily manned the helm, navigation and science stations on the bridge when the need arose. Uhura was also a talented singer, and enjoyed serenading her shipmates when off-duty; Spock occasionally accompanied her on the Vulcan lyre. In "The Lorelei Signal", a 1973 episode of Star Trek: The Animated Series, Uhura takes control of the ship when the male officers fall victim to a species of sirens and leads an all-female rescue party. After the sirens are defeated, the Enterprise helps the sirens, and Uhura bonds with the sirens, who are happy at the thought that they might meet men and have children. She is later promoted to lieutenant commander in Star Trek: The Motion Picture, and to full commander in Star Trek II: The Wrath of Khan. Star Trek III: The Search for Spock sees Uhura take an assignment in the transporter room as part of a plot to steal the Enterprise. After locking a colleague in a closet, Uhura uses the transporter station to beam Kirk, Leonard McCoy and Hikaru Sulu to the Enterprise so they can use it to rescue Spock from the Genesis Planet. As planned, Uhura later meets up with her crewmates on Vulcan and witnesses Spock's successful renewal. Uhura has a smaller role in the first, second and third films. Uhura's Song, a novel published in 1985, developed her character further, placing her at the center of the action and introducing Uhura's interest in alien languages. Elements from this novel influenced her depiction in later films and novels. Following these events and the destruction of the Enterprise, Uhura joins her crewmates on a stolen Klingon ship amid a crisis on Earth in Star Trek IV: The Voyage Home. Traveling to the 20th century, they attempt to save a pair of humpback whales in order to repopulate the species. During a trip to San Francisco, Uhura and Pavel Chekov infiltrate the aircraft carrier USS Enterprise and use emissions from the carrier's nuclear reactor to recharge the Klingon vessel's power supply. Kirk and Spock then procure the whales so the crew can return to the 23rd century and save Earth. In light of their heroics, Starfleet Command exonerates Uhura and the rest of Kirk's crew for their illegal activities. Kirk is demoted to the rank of captain after a prior promotion to admiral, but is assigned to command the USS Enterprise-A. Uhura joins Kirk's crew, and once again serves as chief communications officer throughout the events of Star Trek V: The Final Frontier and Star Trek VI: The Undiscovered Country. In The Final Frontier, a romantic interest between Uhura and Montgomery Scott is briefly implied while Uhura seemingly is under the influence of Sybok, but the subplot is never fully developed in the following movies, leading the viewer to assume that the pair continues as friends. In the 2009 film Star Trek, Zoe Saldana plays a young Uhura who is introduced as a cadet at the academy, but is promoted to a communications officer as the movie unfolds. The film is also notable for officially establishing the character's given name, Nyota. This Uhura is initially cold towards Kirk (and is verbally more than a match for him) after he attempts to flirt with her while intoxicated. However, by the end of film, she comes to respect Kirk as captain of the Enterprise. Although Nichols was not consulted over the character's casting, Saldana personally reached out to Nichols, who in turn helped her prepare for the role. A former student of Spock's, Uhura is also romantically involved with him. In Star Trek, the ongoing comic book series by IDW Publishing, they are shown going on a date during her studies at the Academy. When Uhura is initially assigned to the USS Farragut in an attempt by Spock to avoid the appearance of favoritism, she demands that he assign her to the Enterprise, arguing she would have been assigned there had they not been involved. She persists in her complaints until Spock relents. Had she remained on the Farragut, she would have been killed, as that vessel is subsequently destroyed by the villain Nero. Uhura quickly receives a field promotion due to her skill with the Romulan language and remains on the bridge for most of the film. The 2009 depiction of Nyota Uhura generated much online debate, with some fans praising her portrayal, while other fans (including Kirk/Spock fans) disapproved of her romantic relationship with Spock, or suggested that her expanded role in the film was evidence that she had become a "Mary Sue" character. Other fans suggested that a romance with Spock was hinted in TOS, but could not be followed up on due to racism at the time, and that it would have been impossible at the time to depict Uhura in a romantic relationship. When discussing her response to the 2009 film, Nichelle Nichols stated that "there was always a connection between Uhura and Spock" and that the times did not allow for anything more than "hints". Nichols also discussed meeting with Saldana to discuss Uhura, and praised Saldana's portrayal. The intersectionality of Uhura as a black woman was considered important when discussing her romance with Spock, because romances between black women and white men are largely portrayed as cautionary tales in Hollywood films. In the first sequel, Star Trek Into Darkness, Uhura has been serving on the Enterprise for a year and is still romantically involved with Spock. She and Kirk have a good working relationship and share their frustrations with Spock's emotional unavailability (Uhura as his lover, Kirk as his best friend). Uhura is called upon several times to act as a field officer, attempting to use her fluency in Klingon to assist in the hunt for the fugitive John Harrison. She later contacts Spock Prime (at her Spock's request) to consult him over Harrison's identity, and at the climax of the film, helps Spock defeat and capture Harrison after a long chase and fierce hand-to-hand combat. In the second sequel, Star Trek Beyond, Spock and Uhura amicably end their relationship, and have some tension over Spock's intention to leave Starfleet to help the Vulcan survivors, in the wake of the death of Spock Prime. Spock later chooses to remain in Starfleet, and begins to renew his relationship with Uhura. In a 2012 poll conducted by SFX Magazine to find the 100 sexiest female characters in science fiction and fantasy, Uhura, as portrayed by Saldana in the 2009 film, was voted number one. In scientific illustrator Jenny Parks' 2017 book Star Trek Cats, Uhura is depicted as a Burmese cat. On February 29, 2012, Ms. Nichols met with President Obama in the White House Oval Office. She later Tweeted about the meeting, ""Months ago Pres Obama was quoted as saying that he'd had a crush on me when he was younger," Nichols also wrote. "I asked about that & he proudly confirmed it! President Obama also confirmed for me that he was definitely a Trekker! How wonderful is that?!" In the 1968 episode "Plato's Stepchildren", Uhura and Captain Kirk kiss. The episode is often cited as the first example of a scripted inter-racial kiss on United States television. Originally, the scene was meant to be filmed with and without the kiss, so that the network could later decide whether to air the kiss. However, Shatner and Nichols deliberately flubbed every take of the shot without the kiss so that the shot could not be used. In 2016, ScreenRant rated Uhura as the 16th best character in Star Trek overall as presented in television and film up to that time, highlighting the character as a "lingual expert who could handle herself on away missions". ^ "Roddenberry, Gene (U.S. writer-producer)". Museum of Broadcast Communications. Archived from the original on 2008-02-10. Retrieved May 13, 2009. ^ a b Solow, Herbert; Robert Justman (June 1997). Inside Star Trek The Real Story. Simon & Schuster. p. 153. ISBN 0-671-00974-5. ^ a b Solow, Herbert; Robert Justman (June 1997). Inside Star Trek The Real Story. Simon & Schuster. p. 154. ISBN 0-671-00974-5. ^ Weitekamp, Margaret A. (2013). "More than "Just Uhura": Understanding Star Trek's Lt. Uhura, Civil Rights and Space History". In Reagin, Nancy (ed.). Star Trek and history. New York: Wiley. p. 23. ISBN 9781118226346. Retrieved 4 December 2015. ^ Weitekamp, Margaret A. (2013). "More than "Just Uhura": Understanding Star Trek's Lt. Uhura, Civil Rights and Space History". In Reagin, Nancy (ed.). Star Trek and history. New York: Wiley. pp. 24–25. ISBN 9781118226346. Retrieved 4 December 2015. ^ a b Beck, Donald R. (Director) (1991). Star Trek: 25th Anniversary Special. ^ Star Trek episode: "The Man Trap"
^ Mandel, Geoffrey (1980). USS Enterprise Officer's Manual. 201W 18th St. Apt 20A, New York, NY. 10011: Interstellar Associates. p. 27. ^ Greven, David (2009). Gender and Sexuality in Star Trek Allegories of Desire in the Television Series and Films. Jefferson: McFarland & Company, Inc., Publishers. p. 216. ISBN 9780786454587. Retrieved 4 December 2015. ^ Weitekamp, Margaret A. (2013). "More than "Just Uhura": Understanding Star Trek's Lt. Uhura, Civil Rights and Space History". In Reagin, Nancy (ed.). Star Trek and history. New York: Wiley. pp. 31–32. ISBN 9781118226346. Retrieved 4 December 2015. ^ a b Scodari, Christine (September 2012). ""Nyota Uhura is Not a White Girl": Gender, intersectionality, and Star Trek 2009's alternate romantic universes". Feminist Media Studies. 12 (3): 335–351. doi:10.1080/14680777.2011.615605. ^ "Nichelle Nichols answers fan questions". startrek.com. 2010-10-18. Retrieved 2015-10-26. ^ Golder, Dave (March 27, 2012). "Top 200 Sexiest Characters In Sci-Fi". SFX Magazine. Archived from the original on October 17, 2015. Retrieved March 28, 2012. ^ "Social History: Star Trek as a Cultural Phenomenon". centennialofflight.net. September 8, 1966. Retrieved March 23, 2011. ^ "OBAMA Gives Vulcan Salute". USA TODAY. USA TODAY. April 5, 2012. Retrieved 1 February 2017. ^ "Shattered TV Taboos: How Bea Arthur and Others Broke Barriers". TVGuide.com. April 27, 2009. Retrieved March 23, 2011. ^ "After 40 Years, Star Trek 'Won't Die'". Space.com. Retrieved March 23, 2011. ^ Christian Höhne Sparborth (September 5, 2001). "Nichols Talks First Inter-Racial Kiss". TrekToday. Retrieved March 23, 2011. ^ Nichelle Nichols, Beyond Uhura: Star Trek and Other Memories, G.P. Putnam & Sons New York, 1994. pp. 195–196. Vettel-Becker, Patricia (2014). "Space and the Single Girl: Star Trek, Aesthetics, and 1960s Femininity". Frontiers: A Journal of Women Studies. 35 (2): 143–178. doi:10.5250/fronjwomestud.35.2.0143. Weitekamp, Margaret A. (2013). "More than "Just Uhura": Understanding Star Trek's Lt. Uhura, Civil Rights and Space History". In Reagin, Nancy (ed.). Star Trek and history. New York: Wiley. pp. 22–38. ISBN 9781118226346. Retrieved 4 December 2015. Bernardi, Daniel Leonard (1999). Star Trek and history: race-ing toward a white future (2nd, pbk. print. ed.). New Brunswick, NJ [u.a. ]: Rutgers University Press. ISBN 978-0813524665. O’Connor, Mike (December 2012). "Liberals in Space: The 1960s Politics of Star Trek". The Sixties. 5 (2): 185–203. doi:10.1080/17541328.2012.721584. Henderson, Mary (February 1994). "Professional Women in 'Star Trek', 1964–1969". Film & History. 24 (1): 47–59. 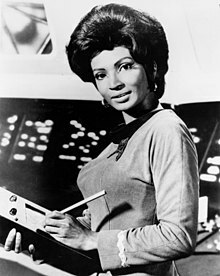 Wikimedia Commons has media related to Uhura.